We often get calls that have a simple solution. While we are always happy to come and resolve your issue, here are some things that might get you going for free. If one of our hints helps you, send us an email and let us know which one. Don't see the problem you're having listed below? Email us and if there is a simple fix we may add it to our list. Need to change a convenience outlet or repair a light fixture? one of the first steps is to turn off the electricity to that device. Sometimes you are alone or the circuit panel is too far from the device you want to repair. Find something loud like a vacuum cleaner or a portable radio (make sure it won't run on batteries). Plug the device into the outlet you want to replace. Then, move the device close enough to the circuit panel so you can hear it (use an extension cord if necessary). Now, turn off the circuit breaker you "think" is the right one for that plug and see if the radio or vacuum cleaner stops. If not, try another until you have located the correct outlet. It isn't rocket science, but it is a simple and effective way to make sure you have turned off the right circuit breaker. Kitchen and bathroom receptacles are often protected with a special circuit called a GFCI circuit. This circuit is intended to prevent electrical shock in areas that are more likely to have water present (ie Kitchens and Baths). It is worth noting that water isn't related directly to the circuit. Some people are under the misconception that a GFCI circuit only prevents you from being shocked in water. This is not the case. While the GFCI circuit is a great enhancement to safety, they can sometimes make you think you have an electrical problem when really you don't. If you have suddenly lost power to the plugs in your kitchen or bathroom, your problem may be as simple as resetting the GFCI circuit in one of the outlets. Look for an outlet that looks something like the one shown here. Note the two buttons in the middle. One of the buttons is a test button and the other is a reset button. Press the reset button and see if the problem goes away. In the kitchen, the outlet will normally be one of the ones above the counter, but it could be elsewhere (even behind the refrigerator if someone didn't plan well). If your problem is a bathroom outlet, the GFCI outlet could actually be in another bathroom. Basically, one GFCI outlet can protect additional "regular" outlets connected to it "down stream." 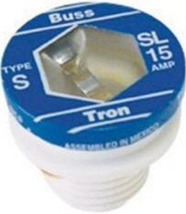 If you suddenly lost power to several lights or receptacles, the culprit may be a blown fuse. If your home has fuses like the ones shown below, the pictures will help you tell of one of the fuses is blown. This is a good fuse. Note that the metal strip across the top is continuous and not broken. This is a blown fuse. Note the burned area and the break in the metal strip. To change the fuse, simply unscrew it like a light bulb and screw in a new fuse which is readily available at most hardware stores. DO NOT touch anything but the fuse and don't put your finger in the socket after you remove the fuse. Be sure to replace the fuse with the correct size. 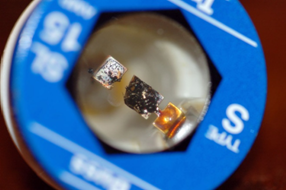 “S” type fuses like the ones in the picture will not allow insertion of an incorrectly sized fuse, but older style fuses will allow it. If a fuse blows one time it's no big deal. Repeatedly blowing a fuse can be an indication of an electrical problem. A compact fluorescent light bulb that is being used with an improper dimmer switch. A note of caution. Lights that get brighter and dimmer (not a flicker), particularly when it happens to multiple light fixtures in the house, can be a sign of a serious electrical problem. If you are experiencing this, please call a licensed electrician as soon as possible. Hi Rod, I Just wanted to let you know your guy came by and did a great job. The work was completed and looks great. I have recommended all of our stores in the bay area to contact you guys should they need any electrical work done. Thanks again for taking care of this so quickly.